A galiot is usually a schooner-rigged vessel that is very bluff both at bow and stern. The ship type originated from the 17th century Netherlands, with a rounded bow and aft. It was suitable for shallow coastal waters. 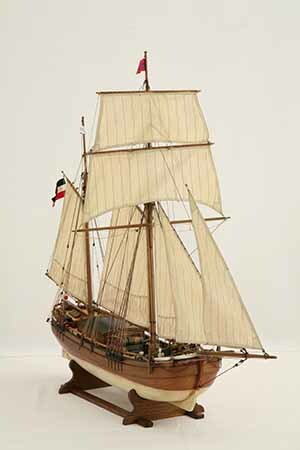 Many variations in size and rigging were built in the Netherlands and at the German North Sea and the Baltic Sea coast. The galiots had a large hold, simple handling of the sails and low draft. These ships were to be used not only for overseas journeys. The draft was crucial for the shallow harbours in the tidal waters of the North Sea coast and for going up river estuaries. Galiots were capable of doing so. The galiot HOFFNUNG could be counted among the koffs, because of the plump hull that was more heavily rounded than with a typical galiot. This provided for more storage capacity. 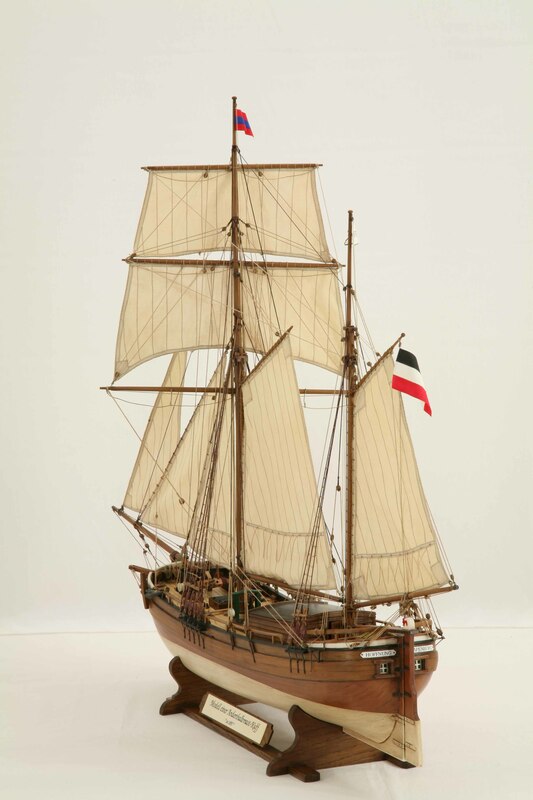 The ship model was built to plans of Manfred Sievers. It is a very beautiful and detailed masterpiece by an experienced model builder. The ship model is 1 : 33 scale. Length is 81 cm, width 28 cm, height 66 cm.